Benjamin Manners, the son of Joseph and Sarah, was baptised in Blackland in 1761. Anne Glead, daughter of Robert and Martha, was baptised in Calne on 8 July 1759. Benjamin Manners married Anne Gleed in Calne on 8 April 1782. 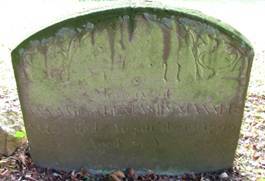 Ann Manners died at the age of 39 on 16 August 1799 and was buried on 20 August 1799 in Blackland churchyard where her headstone still stands. Benjamin made a will in 1835 and died early in 1837. It is clear from his will that Benjamin was a farmer. In 1841 Elizabeth was staying with her son John in Quemerford. She died in 1849. In 1837 his father bequeathed Joseph a cottage in Blackland, occupied by Henry Wheeler. Joseph was a farm worker living in Heddington in 1841 with his wife and 4 youngest children. Also with them was his married daughter Julia Lee with her own daughter. By 1851 Joseph was shown to have a 8 acre farm in Heddington which he was farming with his son George. Joseph died in 1854. James and Sarah lived in Sandy Lane, Whetham, near Calne. By 1871 Sarah had died (1866) and James was living with his married daughter Sarah Weston. James died in 1872. Elizabeth married Cain Duck in 1811 and lived in Blackland, Calne. When her father died in 1837 she was bequeathed the cottage adjoining that bequeathed to her brother Joseph. James Duck died in 1838 and in later census records all his sons were shown as blacksmiths so it is assumed that was James Duck’s trade. In 1861 even Hannah was recorded as a smith! Hannah died in 1866 at the age of 72. Benjamin died in 1874, aged 77. In 1871 John was living at Greenham with Eliza and Mark. John died in 1877, aged 74. Harriet is believed to have married in 1823 and was mentioned as the widow of Jacob White in her father’s will of 1835 but nothing more is known about her. However, Ann must have died before 1835 as she was not mentioned in her father’s will and in February 1836 Charles Romain remarried in Devizes. The family have not been traced after 1851. Sarah was a dressmaker according to her father’s will of 1835 but nothing more is known about her. Jacob was recorded as a publican living in Quemerford in 1851 but has not been traced after that. In 1841 they were in Quemerford and by 1851 the had moved to Bishops Cannings. In 1871 they were near Blakeney in Gloucestershire. Leah’s death was probably registered in Cardiff in 1882.